Arlington County has provided an update on the restoration work taking place on their side of the Run. Construction is nearing completion. The contractor has removed the stone rip rap along stream banks, re-graded the banks, and installed nine living shoreline features. A geocell wall, with plantings as part of the wall, was installed along sections of Four Mile Run as well. Construction on the new viewing platform is underway. Construction of the trail will take place in June, 2017. The lower section of trail (S. Eads to Route 1 has re-opened). We anticipate the full trail will re-open in August, 2017.
providing habitat for fish and waterfowl. The existing stone rip rap that currently covers the stream banks will be removed and replaced with native vegetation that will improve the habitat quality and aesthetics of the stream channel. Some of the stone will also be reused to create the living shoreline features. A close up of the living shoreline, showing the sandy area at the bottom of the stream bank and the newly planted wetland plants. The area will fill in with lush wetland vegetation, providing filtration for the stream water and habitat for animals and insects. The project meets Corps of Engineers requirements to maintain flood protection, improves pedestrian access to the waterway as well as aquatic and riparian habitat. Alexandria recently completed a wetland restoration project across the stream as part of the Four Mile Run Restoration Master Plan partnership. View a flyer about the restoration project (including plant list). The stone rip rap along the bank has been removed, and the bank has been re-graded and planted with grass and native plants. The plants are just beginning to grow. The living shoreline is the sand and stone feature at the bottom of the stream bank. 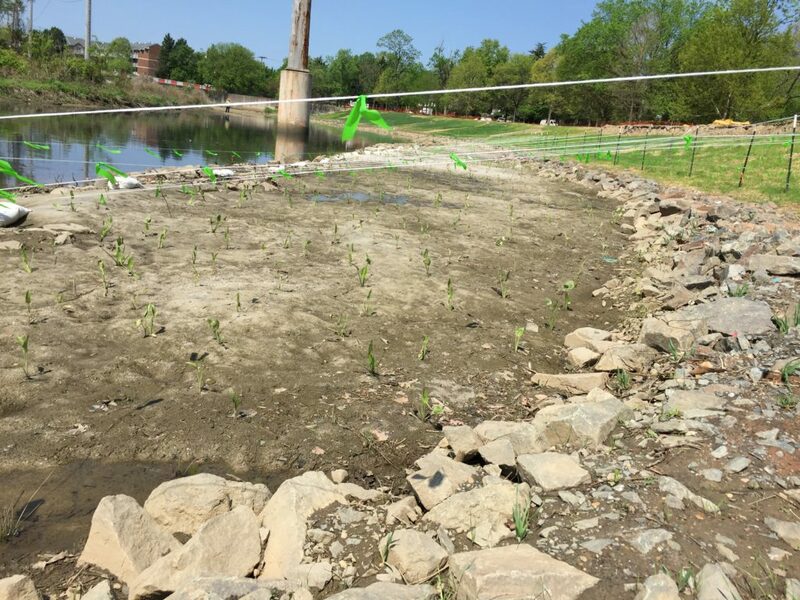 The green flagging on the living shoreline is to deter geese from eating the newly planted wetland plants. During the 1960s and 1970s, Four Mile Run experienced significant flooding events as the watershed became more urbanized. In 1974, Congress authorized the United States Army Corps of Engineers (USACE) to design and construct a flood control channel that would contain the increased flows. In 2000, the City of Alexandria, Arlington County and the Northern Virginia Regional Commission (NRVC) began to explore the stream’s water quality and recreation potentials. The Four Mile Run Master Plan was completed in 2006 and the Design Guidelines in 2009. Naturalize the banks along the corridor and improve access to the stream through overlooks and terracing. Replace rip-rap stone along the banks with native plants. 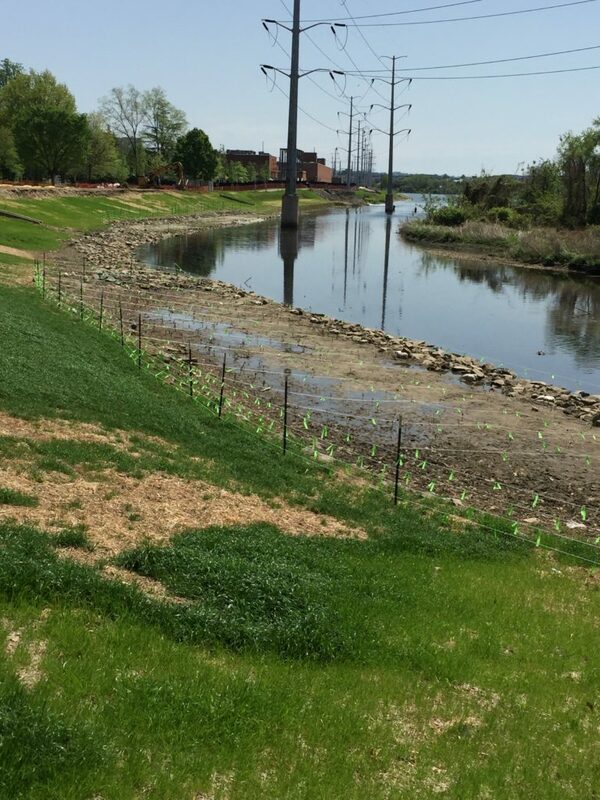 Create living shorelines, which are small breakwaters built from stone with wetland plants behind them, on the Arlington side. The existing asphalt trail adjacent to Four Mile Run will be completely rebuilt to current standards, including a new sub-base and asphalt surface. New trail railings and a new observation platform will be installed. 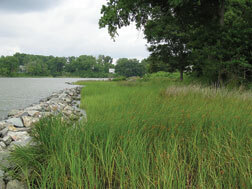 Restore the tidal wetland condition in Four Mile Run Park on the Alexandria side (completed).